K2 mounting systems for photovoltaic installations is a highly recognized German supplier of highly functional mounting system solutions for photovoltaic assemblies. They offer solutions for all types of roofs and roofing systems. Since 2004, K2 Systems has developed pioneering and highly functional mounting system solutions for photovoltaic assemblies around the world. K2 Systems designs all her systems in their own development department in Germany in order to be to adapt and optimize all products to the ever changing market. K2 mounting systems covers nearly the entire spectrum of possible roofing and soil classes. They distinguish between systems for tiles, corrugated fibre cement, trapezoidal sheet metal, standing seams, or flat roofs. Moreover, they offer special solutions for open-site systems. 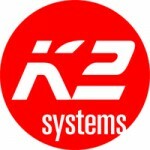 installation manuals and certificates of K2 Systems. Cannot find what you’re looking for?